If a special someone’s birthday is coming up and you want to do something special in spite of your busy schedule, or forgot a birthday and looking for ways to fix it? Don’t you worry, these online cake ordering services will be your saviour. Whether you want a designer cake for bae or exclusive combos for a kitty party, Chef Bakers does it all. The people who have availed their service swear by the quality and they make cakes personalised too by infusing your photos and messages onto them. Another reason to order from Chef Bakers is that they make deliveries even at midnight. Did we mention that they deliver wedding cakes too? Another service that sets Chef Bakers apart is their express cakes service where you can pick from flavours like pineapple, butterscotch, blackcurrant, caramel chocolate, and more and get the delivery within two hours. One of the oldest and most reliable sources of gifting (cakes and flowers) is Ferns N Petals with their plethora of options and quick delivery. Be it a regular black forest cake, or a more extravagant Kit-kat and Gems cake or a classic chocolate truffle cake, they have it all. They also let you choose between egg/eggless cakes and have an easy-to-use website. Prices start at INR 549, and they even deliver the same day. Apparently trusted since 1993, Country Oven is another online service that will get your cake dropped to the location of your choice in the city. Give the gift of enchantment (Yes, that’s the name for a cake!) or go for quirkier options like photo cakes, theme cakes, and tier cakes too. Look out for their best-selling emoji cakes which are a unique way to cheer up anyone, any day. You can also get sugarless cakes from here. Prices start at INR 675, and you can go for combos too, where the cakes come with Kinder Joy. Winni’s cakes can be delivered all across the country. So no matter where your fam or friend is, send a cake to them. Be it a congratulatory celebration or a festival, or an anniversary or birthday where you need the perfect cake, just scroll through their website and you shall not be disappointed. We’re loving their combo options wherein you can send a fabulous cake, a beautiful bouquet, and some chocolates too. They also do same day delivery, but charges may be higher for that. Prices start at INR 599. For freshly baked hand decorated cakes, you can order from Cake Zone which delivers in Hyderabad, Bengaluru, and Pune. From edible printed photo cakes to cheesecakes and cupcakes, they deliver it all. We’re loving their Unicorn Island cake, and elegant graduation cake, but their collection is vast. 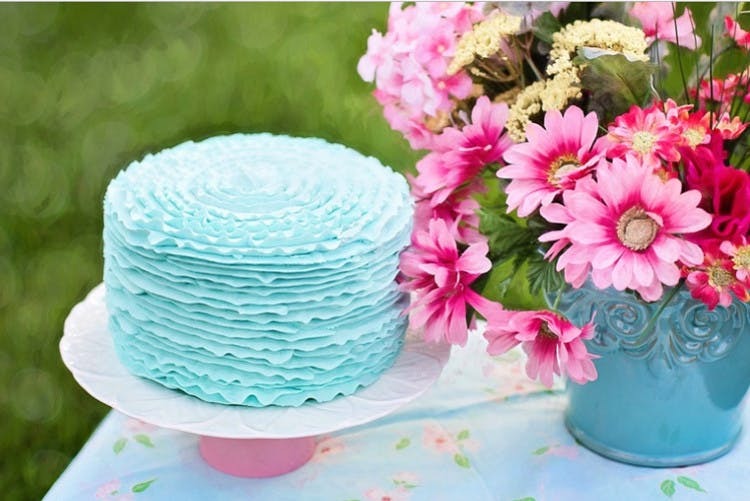 So, browse until you find a cake that matches the vibe of your party and order on. They order between 7am to midnight, but make sure to place an order before 10.30pm for same day delivery. Prices start at INR 419.